Checking PPSR is vital before you buy the vehicle! If you are buying an used vehicle or boat in Australia it is important to check the vehicle history before you buy. 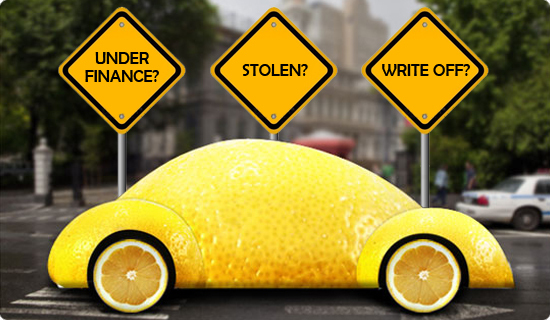 Our instant vehicle report will uncover any potential issues. There is a risk involved in buying a used vehicle, and we want to minimise that risk by providing the information that will help you make informed decision. Get PPSR report & buy with confidence. iREGO provides instant easy to read report on a Car, Motorbike, Van, Truck, Trailer, Caravan or any other vehicle registered in Australia. It doesn't matter which state the vehicle is in, we deliver vehicle history reports Australia-wide. So even if you are buying from interstate we got you covered. You are probably spending thousands of dollars on a used vehicle. Getting a vehicle report for $9.90, its a small fee for a great peace of mind. Unlike other websites where you wait for the results to come via e-mail, we provide easy to read results on your screen instantly after payment. See the Sample vehicle report. The report is automatically emailed to you with the official PPSR certificate attached. iREGO uses highest encryption available today. Payment is processed by certified payment gateway and we do not collect any personal information except for your email. In case you have trouble our friendly Email, Live Chat and Phone support will get things sorted quickly. 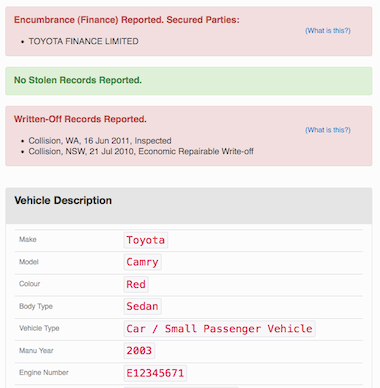 Stolen Car Check What is VIN?